Our frozen aisles are filled with your favorite products to get you through your fast-paced days. From breakfast to dinner to afternoon snacks, we have items that are nutritious and delicious. Don’t forget to try our Shurfine Pizza - they taste like your favorite brand, but cost much less! 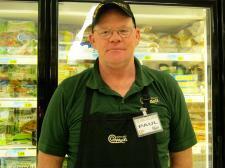 If you have any questions or requests ask Paul our frozen department head.